Experience warm hospitality at La Quinta Inn & Suites Loveland! 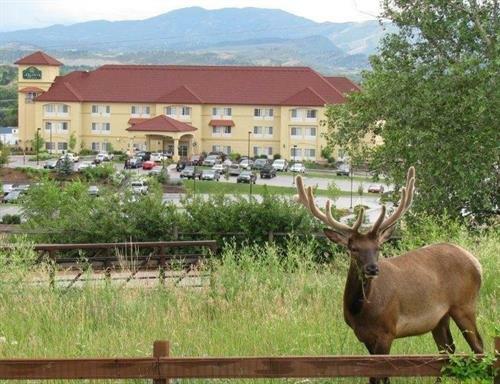 Nestled in the foothills of the Rocky Mountains, La Quinta Inn & Suites Loveland offers majestic mountain views and easy access to many of the city’s top destinations. Our location provides easy access to many of Loveland's cultural assets, including two foundries, numerous studios and galleries, the Rialto Theater Center, the Benson Sculpture Garden, and the Loveland Museum. Loveland’s historic downtown district is only a short distance away and is home to numerous locally-owned businesses, craft breweries, shops, and restaurants. Within minutes of the hotel is one of the most impressive and visible natural landmarks in Larimer County- the Devil’s Backbone- an open space and nature trail perfect for hiking, mountain biking, running and wildlife viewing. Plus access to 18 miles of recreation trail is just footsteps behind the hotel. Golfers will enjoy our proximity to all 3 of Loveland’s golf courses. Not to mention, just a scenic 26 mile drive west is Estes Park- the gateway to Rocky Mountain National Park (RMNP). We invite you to take full advantage of the many indulgences offered standard at La Quinta Inn & Suites Loveland including a complimentary Bright Side Breakfast® each morning, free high-speed Internet, heated indoor swimming pool and hot tub. Flat screen TVs with premium programming, microwave ovens, refrigerators, and coffee makers are standard in every room and suite. Come and enjoy our clean and comfortable accommodations and many other amenities delivered with friendly service and a smile. I-25 to US-34 W via EXIT 257 toward Loveland/Estes Park. Continue to follow US-34/Eisenhower Blvd for 7 miles to Cascade Ave. Turn right on Cascade Ave, hotel will be on the right.